Carolina Herrera dress in floral striped chiffon. A.L.C. 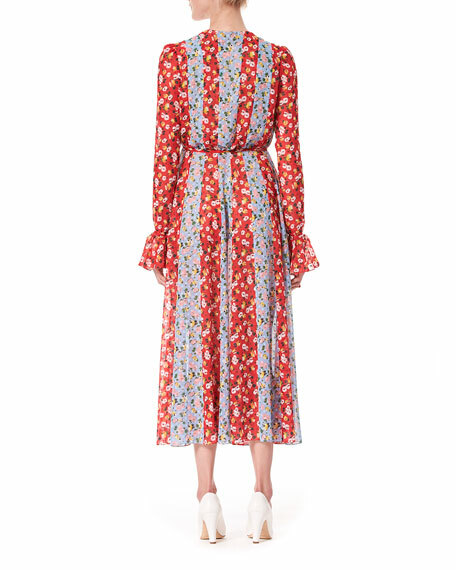 "Viera" tiered dress in floral-print silk. Plunging V neckline. Short flutter sleeves. Fit-and-flare silhouette. Hem hits above knee. Slipover style. Imported. Model's measurements: Height 5'11"/180cm, bust 31"/79cm, waist 23"/58cm, hips 34.5"/87cm, dress size US 0/2. ATM Anthony Thomas Melillo velvet camisole dress. V neckline. Spaghetti straps. A-line silhouette. Slipover style. Midi length. Viscose/silk. Imported. Model's measurements: Height 5'10"/177cm, bust 33"/84cm, waist 25.6"/65.2cm, hips 35.8"/91cm, dress size US 2-4/FR 34-36. 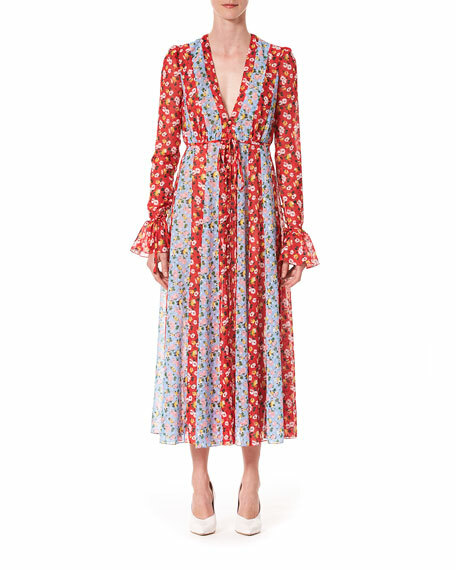 Maggie Marilyn dress in printed silk. V neckline; neck tie. Sleeveless. Straight silhouette. Maxi length. Slipover style. Polyester/viscose lining. Dry clean. Made in New Zealand. Model's measurements: Height 5'10"/177cm, bust 33"/84cm, waist 25.6"/65.2cm, hips 35.8"/91cm, dress size US 2-4/FR 34-36.